Yousu Women Oxford Waterproof Anti-theft Backpack Ladies Fashion Casual Double Zipper Shoulder Bags Lightweight Outdoor Travel Rucksack. 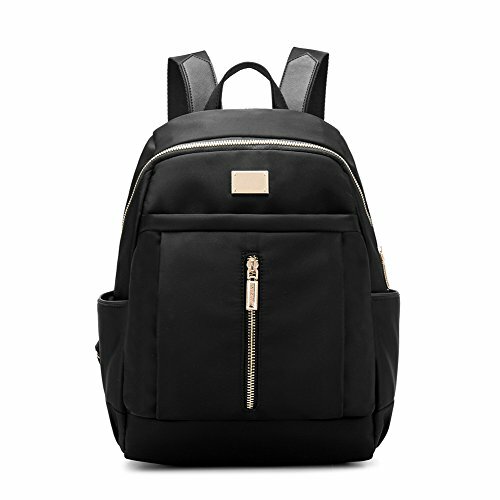 This backpack made of Oxford fabric material, lightweight and cool style. Ideal for daily life, it's practical and durable. It is roomy enough to accommodate your mobile phone,umbrella,sunglasses,IPAD,cosmetics and any other daily things.It has enough compartments to hold your daily essentials and can help you keep the daily essentials organized in it. At the same time, the back zipper and dual-acess zipper design,protecting all your valuable items and provide privacy, which is anti-theft and reliable.Moreover,easy to match with your any garments,this backpack will be a fashionable and useful product into your wardrobe.Perfect for any occasions, such as working, outdoor, travelling，beach, going shopping or business etc. Material: Lightweight and durable waterproof Oxford Fabric. Item type:women backpack,women handbag,women shoulder bag,women travel backpack,camping backpack. Closure Type: Top zipper closure. Internal structure:one large compartment, one zipper pocket. External structure:one main zipper compartment,one front zipper pocket,two side pockets,one back zipper pocket. Washing instructions:Hand wash with cold water.Hang to dry. The actual color of the bag maybe different from the picture shown due to the different screen of display or reflecting light when shooting.1-2cm error of measuring is a reasonable range due to different measurement methods. Yousu always strive to provide high quality products and the best customer service for our customer. If you have any questions about our product, please do not hesitate to contact us. Material: Lightweight and durable water-resistant Oxford Fabric. Net weight: 0.6kg. Dimension:10.2" L*5.5" W*15" H/26*14*38cm. Large Capacity: 7 pockets - one main zipper compartment, one front zipper pocket, two side pockets, one back zipper pocket. One large compartment and one zipper pocket inside. It has enough compartments to hold your mobile phone, magazine, water bottle, umbrella, sunglasses, IPAD, cosmetics and any other daily things, can help you keep the daily things organized in it and easy to find. The back zipper and dual-access zipper design, protecting all your valuable items and provide privacy, which is anti-theft and reliable. This bag also has a front zipper pouch, you can put your small items into it. It is very stylish and functional. In terms of comfort, the shoulder straps are adjustable to where it feels good to wear, protecting your back when carrying. The adjustable strap buckle is reinforced with metal. The zipper is GOLD. Ideal for daily life, working, outdoor travelling, going shopping, hiking, camping or business etc. It will be the great choice for you to show your temperament. Warranty: All Yousu bags enjoy 1 year warranty and 30 days free return for any reason. If you have any questions about this product by Yousu, contact us by completing and submitting the form below. If you are looking for a specif part number, please include it with your message.